The Oakland-based Global Footprint Network – a nonprofit that calculates the demands of human economies on ecosystems – has released the ecological footprints of almost 150 countries in the 2017 edition of the National Footprint Accounts. In aggregate, these accounts suggest that the world has been running a widening ecological deficit since about 1970. 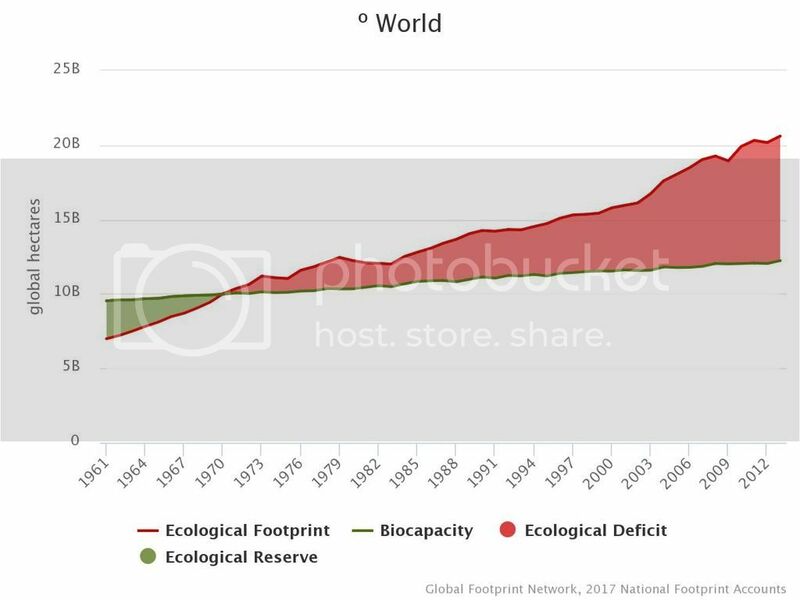 The graph below highlights the gap between aggregate human demands on nature (i.e., the Ecological Footprint or EF) and nature’s capacity to meet those demands (i.e., the biocapacity) for nearly 150 countries from 1961 to 2013. A country has an ecological deficit if its EF exceeds its biocapacity. It has an ecological reserve if its biocapacity surpasses its EF. EF is a measure of aggregate human demands, or the human load, imposed on the ecosphere. When all is said and done, the human economy, the production and consumption of all goods and services, is entirely dependent upon Earth’s natural capital – its arable soils, forests, croplands, rangeland, pastureland, fishing grounds, clean water and air, atmosphere, ozone layer, climate, fossil fuels and minerals – to perform the ecological services and provide the materials, energy “sources” and waste “sinks” that support civilization. Draining natural capital beyond its regenerative capacity leads to ecological drawdown, or depletion of capital stock, just as drawing down the principal of a savings account or inheritance will eventually exhaust it. When humankind began to exploit fossil fuels at the onset of the Industrial Revolution in the early 19th century by starting to mine coal in earnest, drawdown began to accelerate. It grew exponentially in the 20th century and continues growing today almost unabated, in spite of warnings, conservation and improved efficiencies. EF analysis compares the demands of the human economy, or subsets of it, with Earth’s (or a given country’s) ecological capacity for regeneration and renewal, called its “biocapacity.” EF represents the amount of biologically productive land and sea area needed to regenerate the resources a given human population consumes and to absorb or assimilate the corresponding waste or residuals it generates. 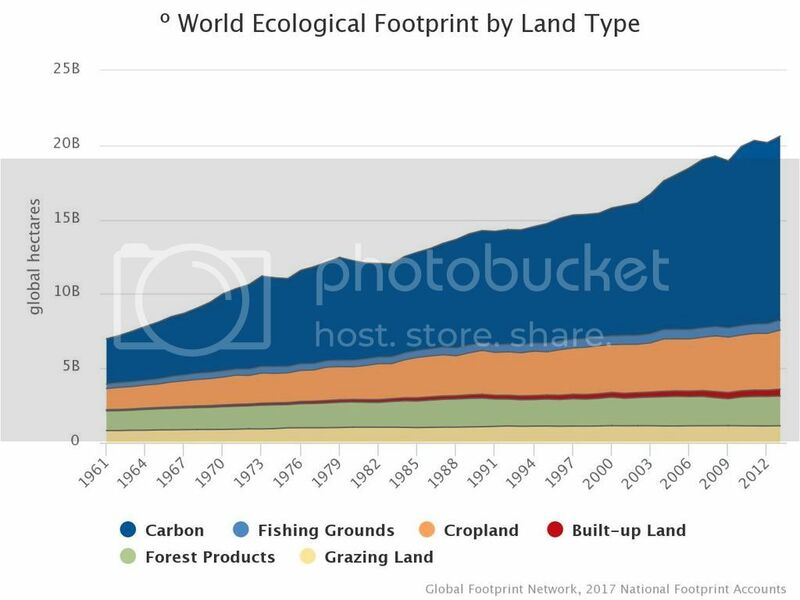 All told, according to the recently released 2017 National Footprint Accounts, in 2013 the world’s population would have needed 1.7 Earths to support its excessive demands on renewable natural resources. The correlation between the size of a country’s population and its ecological footprint is striking, though unsurprising to ecologists who understand that every human being has an environmental impact, however large or small. Let us compare the countries with the largest and smallest ecological footprints. Every country in the table showing the largest ecological footprint (left side) is well-known and prominent on the world stage. They are also very populous. In contrast, in the table on the right, many will never even have heard of some of the countries with the smallest ecological footprints, because they are small and inconspicuous on the world stage. They are mostly small island nations in the Pacific, Atlantic and Caribbean. Every one of the countries with the highest aggregate ecological footprints has a high population, as shown in the next table. In fact, six of the countries with the top ten largest EFs are also among the top ten most populated countries on Earth. And they are all among the 22 most populous countries in the world. The mean population size of the ten countries with the largest EFs in the world is 401,247,893, and the median population size is 177,309,113. Now contrast this with the populations of the top ten countries with the smallest EFs in the world (upper table on right). The mean population size of the ten countries with the smallest EFs in the world is a mere 56,749, and the median population size is 58,565. These are tiny fractions of the most populated countries. This comparison may seem pointless and obvious to rational, sane people. Countries with large populations, i.e., higher numbers of consumers, tend to have large ecological footprints. Well duh! And people who are taller tend to weigh more than people who are shorter. This isn’t rocket science. Yet hundreds of millions of people around the world remain ignorant of these fundamental facts. And millions of others, including many politicians and leaders, who have been exposed to these facts, still somehow manage to downplay or even deny that population has anything whatsoever to do with ecological impact. Even more unconscionably, there are environmentalists and environmental groups who not only are in denial, but who accuse groups like Californians for Population Stabilization of despicable motives (“hate,” “racism,” “xenophobia,” “nativism,” blah-blah-blah) simply because we forthrightly recognize the link between population growth and environmental degradation. And because we advocate steps to halt this unsustainable, cancerous population growth. And for these groups and individuals, perhaps a counter-accusation is in order. They are watermelons: green on the outside, red on the inside, a.k.a. neo-Marxists and social justice warriors (SJWs) whose main motivation is not ecological sustainability or environmental conservation, but a new world order.